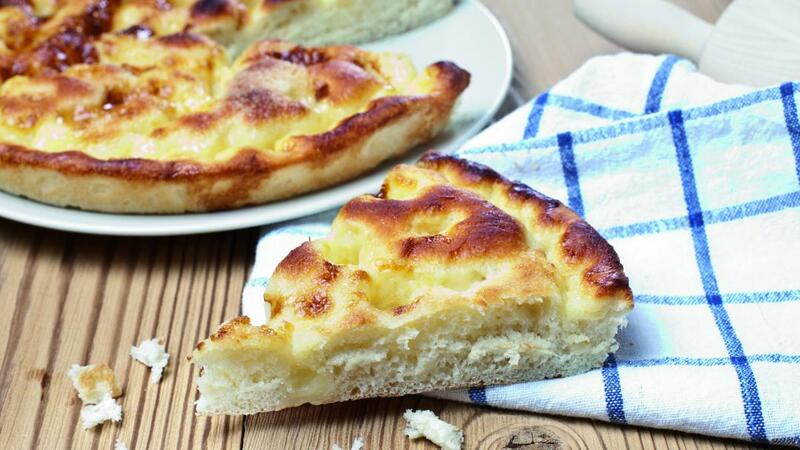 This tart, also known as the "Gâteau du Vully", is a delicious regional speciality. The original version of the Vully tart is a sweet speciality, but there are also several other varieties. Salty, with lardons and cumin, or with almonds. Historically, it is difficult to know when or how this pastry was born. Several recipes have passed from mothers to daughters over the decades. 15 g fresh yeast, mixed in a little warm water. Add the flour, yeast, melted butter and 1/3 of the milk to a bowl. Knead together, gradually incorporating the lard and egg, until the dough is light and airy (approx. 20 min.). Roll out the dough and place into greased baking tins. Leave the dough to proof (approx. 1 hour) in a warm place. Prick the sides with a fork. Make shallow holes using your fingers (use a rolling pin to stretch the holes into lozenge shapes). Place pieces of butter into the holes/lozenges. Pour the cream and egg mixture over the top. Sprinkle evenly with the coarsely ground sugar. Bake in a hot oven (300°) for 8 -10 minutes. Enjoy it without moderation with a glass of Traminer from the Vully.